We were only 30 seconds into class and I was already panicking. Where is their homework? Did none of them do it? Their empty desks taunted me, predicting the misery that was to follow. Out of 23 students, only 9 had their homework done. "Greg, Sarah, Olivia, Dillan, Eva, and Cara. You're up!" As they sulked to the board and grabbed a marker, I took a deep breath, willing the panic away. "Everything will be fine. We'll review the problems, answer questions, and be back on track." But as the board slowly filled with algebra, my resolve gave way to frustration and I shook my head in disbelieving resignation. None of these problems were worked correctly. Not one. This just isn't working, I thought. First, the majority don't even attempt the homework. And then those that do clearly needed help and I wasn't there. Fortunately, there is. It's called flipping your classroom, and if you're ready to better support your students (and escape the homework rat race), you're definitely going to want to try this out. What does it mean to flip your classroom? Traditionally, you teach new concepts during class and have students practice them at home for homework. But with technology, you can flip that around. Your students watch a video at home that explains the new concept to them. Then they practice during class the next day. What videos do my students watch when I flip my class? You can either create your own teaching videos or use videos that someone else has created. If you love teaching certain concepts or have a special way of explaining them, you might want to invest the time into creating your own teaching videos. You can record them during your free time (because you have so much free time, right? ), but you also might try recording yourself teaching live (to use in other sections of the class or for the following year). Depending on your topic, you may also be able to find great videos online. Try searching YouTube, Teachers pay Teachers, or educational websites related to your topic. And if you teach pre-algebra, you're in luck. 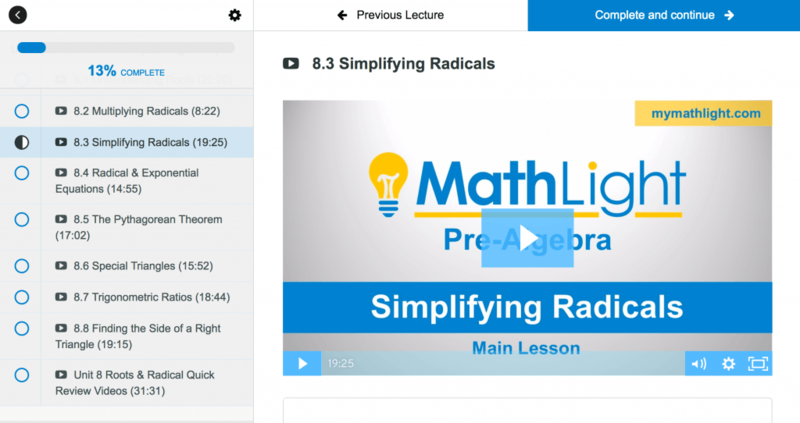 MathLight, our sister website, has created free teaching videos covering a variety of pre-algebra topics. Get free pre-algebra lesson videos here. Or, get﻿ single video lessons with the accompanying notes here. How can I make my own videos? If you have a smart board and Smart Notebook, they likely include a digital recorder that can record both your voice and whatever is displayed on the smart board. If you don't have a smartboard, you can simply set up a video camera and record yourself explaining the concept. Or, if you have a power point, digital notes, or something else on your computer that you want to show your students, you can use a free screen recording software like Screencast-o-Matic to record your computer screen as well as your voice as you explain what's shown on your screen. How do my students watch the videos when I flip my class? If you're making your own videos, you can upload them to YouTube and simply send your students the link. Or, you may be able to upload them directly to your class website. If you're using videos you found online, you may be able to send your students the direct link. Or, you can check with the provider to find the best way for your students to watch them. How do I know if they actually watched the videos? You could simply go on an honor system and ask your students if they watched them, but we all know how unreliable that is. Instead, ask your students to take notes about what they watched and show them to you the next day. What if some of my students don't watch the assigned video? 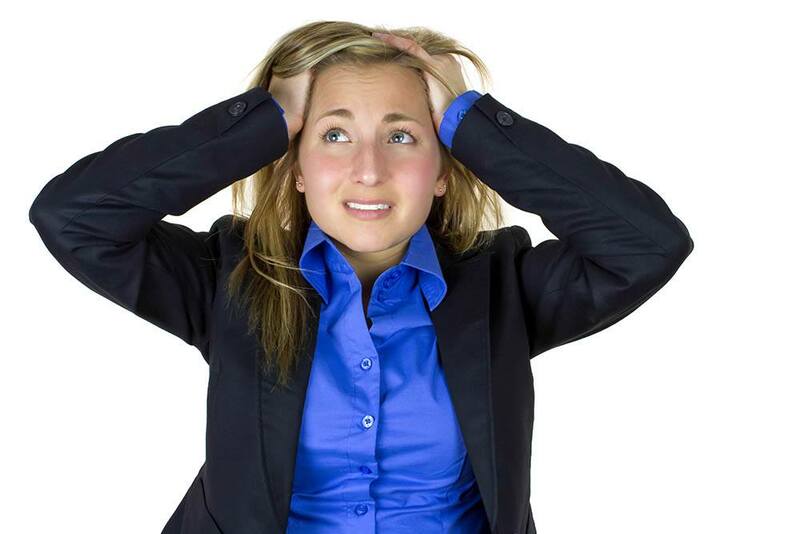 Use whatever procedure or policy you have for when students don't complete homework. Or, require those students to watch the video during class instead of joining the rest of the group. Then, assign whatever they missed during class (or an alternate assignment) for homework that night. Simple answer - as long as they need to be to teach the concept. Keep them as short and concise as possible, but take the time needed to fully explain the lesson. The optimal length will depend on the age of your students. But think maybe 10-15 minutes for elementary students or 15-30 minutes for middle school / high school. What do I do during class when I flip my classroom? You may want to start by answering any questions the students have and/or by working an example together. Then, assign some type of practice for students to build their skills - and for you to walk around and answer personalized questions. The great thing is that you can get creative in the different forms this takes. You could simply have students work individually, but you can also have them work in groups or complete more creative activities. How often should I flip my class? How often you flip your class is totally up to you! You could flip it every day or only occasionally. For example, if you just want to try it out, consider flipping your class the day after a test. Students watch the video the night after they take the test, then you practice together or do an activity the next day. Is it really worth all the extra effort to flip my class? Absolutely! You'll be amazed how many benefits you'll discover. When you flip your classroom you also have tons more time to interact with your students one-on-one or in groups while they work on assignments. This means you can give them better help, correct misconceptions, and even more easily differentiate based on their needs. When a kid is absent, there's no problem. They can just watch the video & make up the work easily. And that's just the tip of the iceberg. 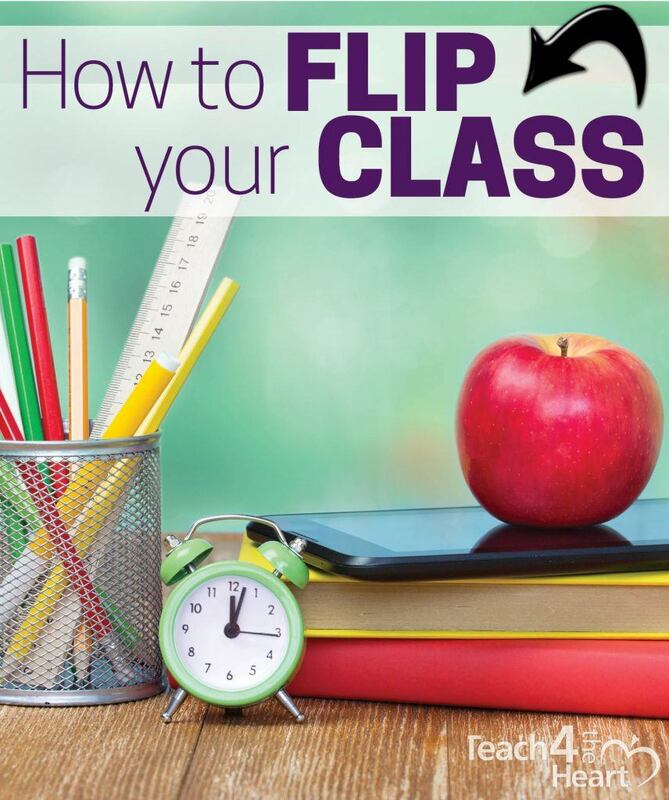 Check out this article for 10 reasons you should try flipping your class. What if some students don't have internet access at home? Students may be able to watch the videos in the computer lab during study hall or after school. Check with your admin to see if this is possible and what procedures you need to create. Most libraries offer free internet access. Consider if this is something you could suggest or require students to use. If you have the actual video file, students could bring flash drives and you can load the videos directly onto them. Quick, easy, and inexpensive, as you can typically get a flash drive like this one for under $10. How can I get started flipping my class? Look ahead in your plans for a topic that you could easily teach via video - or that you know you could find a great video for online. Prepare the video and plan what practice, group, or hands-on activity will best help them comprehend the topic. Prepare the activity for the next day. When the time comes, assign it to the students to watch for homework. Hold them accountable by requiring them to take notes, giving a brief comprehension quiz the next day, or asking them to summarize what they learned. Then use your class time to help students as they work, practice, and learn together. You'll love interacting more with the students - and also the lack of panic attacks. We're working with Rick Scarfi of MathLight to bring you amazing math videos & curriculum that will allow you to easily flip your classroom without all the extra work. And the best news? All our pre-algebra videos are currently available for FREE! Click here to find out more & get your FREE videos now. Or, click here to purchase single video lessons with accompanying notes. I really like your advice ,it has rich information about teaching. you impacted me more of teaching techniques. God will keep keeping you up.